High over Lake Geneva with a view of the grand panorama of the French Alps one of the most remarkable biotech facilities in the world is emerging: the Merck Serono Biotech Center. This is where, from 2012, the cancer treatment product Erbitux will be produced using reliable automation technology in ready to install control cabinets from Festo. Merck Serono, the pharmaceutical arm of Merck KGaA, is investing 350 million euros in its new plant and creating 200 new jobs for biologists, engineers, technicians and laboratory staff. 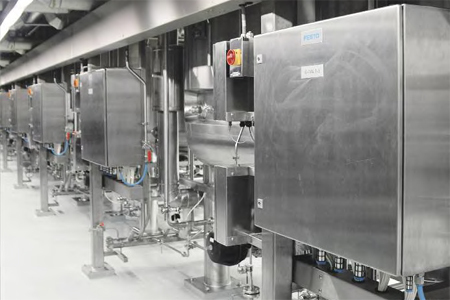 Drugs based on complex molecules that cannot be synthesised chemically are created in a biotechnological process on four production lines with a bioreactor capacity of 140,000 litres. This includes the development of the cell bank, the production of proteins in the bioreactors and filtration and purification for the purest protein concentrations.